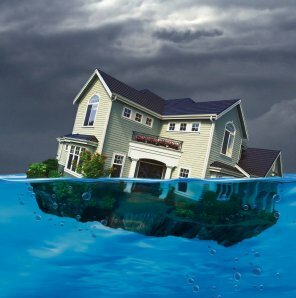 Why are so many homeowners underwater? Several years ago, the psychology of the home buyer was to become a homeowner as part of the “American Dream”. If they faced an obstacle paying their mortgage, they could sell the house for more than they purchased it for because it was assumed that real estate always goes up in value. However, this assumption is WRONG. Some people had loans that were adjustable, and simply reset at monthly payments that the homeowner could not afford. Others, had loans that they never should have been approved for, had it not been for some loose banking policies that were not seen as risky provided that the market would continue to rise. The other category of homeowners, were faced with hardships such as unemployment, illness, disability, death of a spouse, non-payment from tenants, and/or unforeseen major repairs needed to the property. The reality of our world also tells us that there are a percentage of homeowners who will try and use this banking crisis as an opportunity to take advantage of a situation and fraudulently attempt to do a short sale while they have the ability to repay the loan with other assets they possess. It is important for homeowners to confront these obstacles when faced with them to avoid falling into a possible foreclosure proceeding.